This was an up-and-down week, with some great moments—lots of laughing and smiling, even more interest in playtime, starting to move towards flipping over (uh-oh)—but also a lot of disrupted sleep and a tough weekend with lots more crying than normal. I've been reading Healthy Sleep Habits, Happy Child (recommended by most moms I know plus my pediatrician), which was what had me put him on the strict never-awake-more-than-two-hours plan, which worked wonders on napping. We are getting closer and closer to needing to sleep train, I think. Tucker has been such a good night-time sleeper since the beginning, but he has started regressing lately. Some nights he will go down at 7:00 and sleep all the way through until 6:30 a.m., without making a peep. But a couple times this week it took an hour-and-a-half to get him down, all rocking and swaying and second feedings and chaos, which we've never had to do before. And then on those nights he's woken up during the night needing his pacifier, along with reinstating a feeding at 4 or 5 a.m. It's just so inconsistent. I know that at less than four months old I can't expect 12 hours of sleep every night (though it's worth mentioning that he is about the size of a typical 6-month-old, so in terms of how often he needs to eat we are pretty far ahead of the curve), but I can't figure out why some nights are so great and others are terrible. He has begun sneaking his hand up and out of the Halo Sleepsack Swaddle some nights, which definitely wakes him up. And I think we're almost to the point where we need to get rid of the pacifier. He's getting really good about sucking on his hands, and I think we'll need to just go cold turkey and unswaddle him, release the hands, and get rid of the pacifier. I'm dreading it but I guess it will be better in the long run. I went to Target and Carter's to get a couple sleepsacks with arms so he'll stay cozy once he's not swaddled, and I was happy to find them marked down to $7.99 at Carter's, and $8.99 every day at Target. The Halo sacks are nicer fleece but they're sleeveless and cost about $20 each. In preparation for sleep training I've been trying to be more consistent with a bedtime routine--bath, book, song, swaddle, eat, bed. 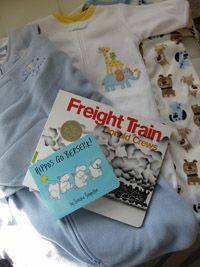 Our favorite books at the moment are Freight Train, by Donald Crews (amazing graphic illustrations) and Hippos Go Berserk by the one and only Sandra Boynton. I have it memorized but it still amuses me. I know this sounds ridiculous, but I love that she changes the rhyme scheme from the first half (all the hippos show up to party) to the second half (they all leave). My favorite: "Nine hippos and a beast join/Eight hippos headed East, while..."
The other purchase this week is one we should have made months ago. Ben visited my friend Brooke out in San Francisco on a work trip, and hung out with her son, Tucker's almost-twin (born 36 hours later at almost the exact same size!). He came home all full of enthusiasm about the Diaper Genie. Yes, that's right, we were still using the cheapo trash can we bought to hold our cloth diapers. Which we stopped using after a couple days. And while it held the smell in pretty well, there was definitely a bit of lingering....aroma...as the bag filled up. I ordered it from Amazon (oh Amazon, you have locked me in, with your free Prime membership and two-day shipping! Why should I bother going to a store?) and it arrived yesterday. We got the Elite model, which has a foot pedal. Hurray! So far, so good. And it's smaller than the trash can, too, which is a bonus. Totally un-baby-related, but is anyone else on an eggnog bender? The local dairy where we get our milk has eggnog out for the holidays and I'm developing a bit of an addiction. (No, I'm not spiking it. Yet.) I've been drinking it cut with lowfat milk, so at least it's a *little* less deadly, but it's a good thing the season is short! Have a great week, everyone. I'm terribly behind on my holiday shopping, so that's going to be my main focus during Tucker's mini-naps this week. Oh internet, what did people do before you existed?